The Gorinir family, a cadet branch of the royal Camoran line, has fallen on hard times and had to sell their palatial Cormount home. The seasons turn, luck changes, and their loss is your gain. The Gorinir Estate is a large player house in northeastern Grahtwood. The grounds contain a large number of trees and rocks, even when not furnished, enough to earn you the Conservatory Decorator achievement immediately upon first entering. 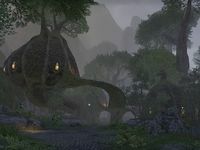 The house itself consists of a three-pod Bosmer style structure, with one entry pod leading to ramps to the other two. There are Wall Torches in each of the enclosed pods, and several more around the grounds. Gorinir can be found in the game, and is involved in the Blacksap Rebellion.